It is review week! Later I will review the Dresden Files Cooperative Card Game and The Book of the Tarrasque, but let’s first turn to minis! As with the 4th Set, Monster Menagerie, this set is not tied to a particular storyline adventure. However, that may be due to the timing. Monster Menagerie was later found to be tied to Curse of Strahd… is this tied to the next adventure? Or, like Tales From the Yawning Portal, is it tiding us over? If you are new to minis, this is a strong set. You get a nice variety of core humanoid types and cool monsters. For the infrequent collector, this is a slightly weak set. The types you already have (goblins, hobgoblins, etc.) are good, but not outstanding… you can instead pick up just the few truly exceptional minis. For the collector that must have everything, this is a good to strong set. The exceptional minis will make you happy, even if this set is a step back from the previous (5th) set. That previous set, called Storm King’s Thunder, was magnificent. You can see a gallery here. Two things really set it apart. First, a ton of huge-sized minis for giants! You may not be a fan of giants suddenly being much larger than older minis (I’m not), but the sculpts and colors were really excellent. Super-evocative. Second, the set came with variants. Many of the giants and some other figures came in an A/B variant. The variants usually had different colors and a different weapon. This made getting “duplicates” much more fun, because many of them were actually variants. Monster Menagerie II doesn’t give us any huge minis, and the variants are more limited. 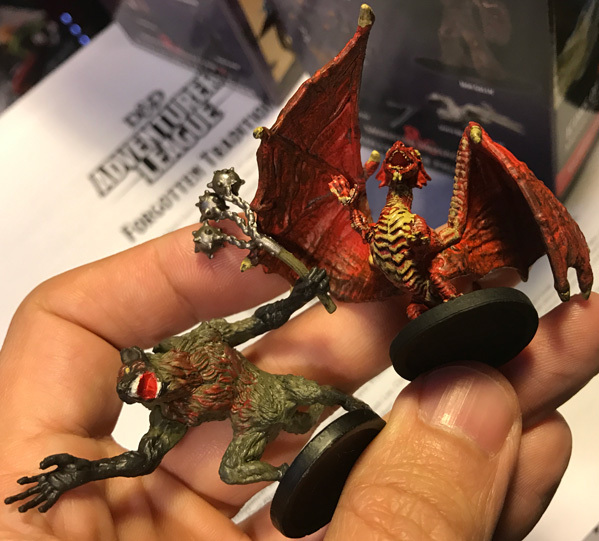 Monster Menagerie II consists of 43 unique miniatures (plus 15 ultra-rares), sold in booster boxes of 4 randomized minis. You can purchase a “brick” of 8 booster boxes, or a “case” of 4 bricks (32 boosters). The booster’s $15.99 list makes it a relatively good purchase at your FLGS and I always like to support my FLGS when I can. You save a few bucks on Amazon. 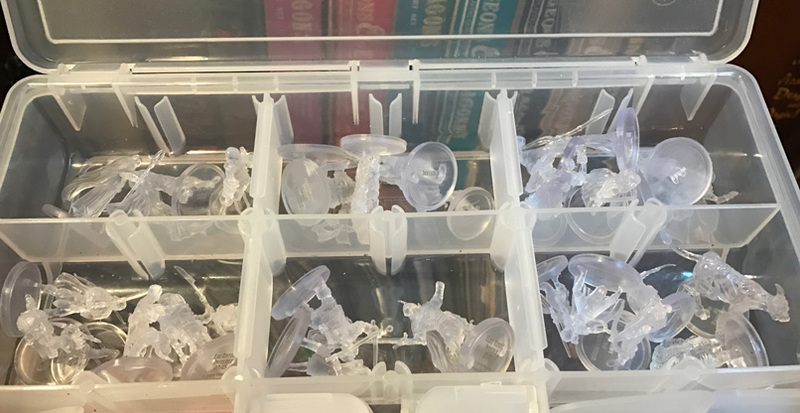 Case purchasers should look into sites such as Miniature Market, which has a case for $370, bricks for $95, and boosters for $12. Within the set, there are 13 Common, 20 Uncommon, 10 Rare, and 15 Ultra-Rare miniatures. Compared to previous sets, there are far fewer Rares (10 instead of 12-17) and many more Ultra-Rares (15 instead of 5-10)! That is disturbing, because in a case we are guaranteed rares but not Ultra-Rares. Worse still, this set includes some Ultra-Rares (Mind Flayer and Uthgardt Barbarian) that would have been rares in previous sets, and they even have variants! To add insult to injury, we could use a bunch of those Uthgardt Barbarians when running the Storm King adventure! Ultra-rares are expensive, making the full set cost much higher. (In my case I landed 7 of the 15 Ultra-Rares). 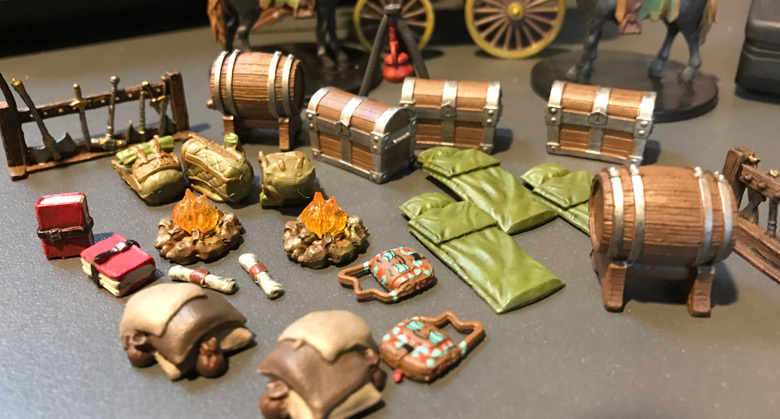 The set also has a jaw-dropping “case incentive”, called “Adventurer’s Campsite.” It features Ezmerelda’s Wagon (from Curse of Strahd) and a host of useful terrain pieces, plus two large horses. The price has gone up as it sells out, with $85 at Miniature Market … and still worth it compared to other terrain sets. You normally receive it at a discount when you purchase a case and the case incentive. 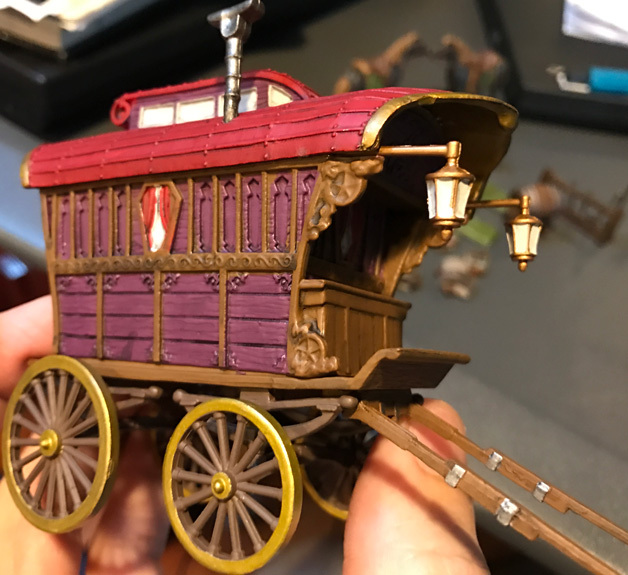 You can see the great detail on the wagon and the camp items. This set has a variety of monsters, though it has almost no elementals and no evil outsiders. Is it meant to help run Yawning Portal‘s classic adventures? Perhaps. The mix is honestly a bit strange, duplicating both older DDM sets and newer WizKids sets at times, while adding a few new items. The distribution is a bit strange, with some minis being more common than we would want. You can find the entire list on the excellent Minis Gallery web site. If you want a way to track your collection, check out my D&D Miniature Collection Tracker. Let’s show off some minis, starting with the uncommon Black Pudding! This was in the first box I opened and is a terrific mini. Even better, you can put another mini inside of it! 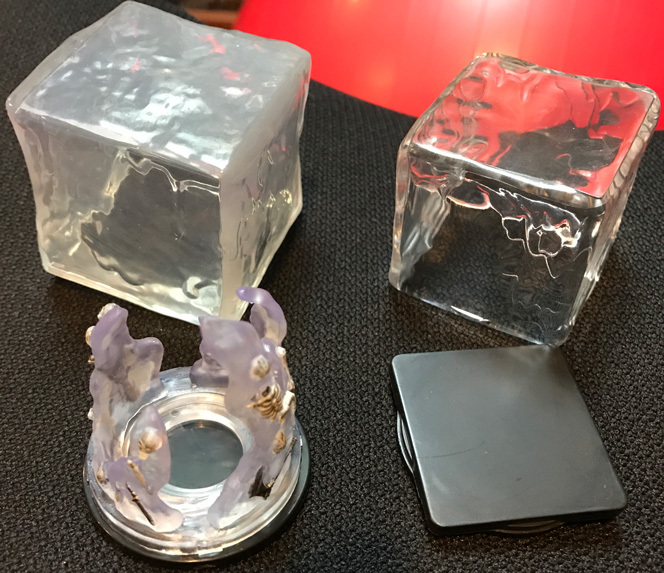 This is evocative of the recent Gelatinous Cube, which improved upon the old DDM version by creating an inner ring into which you place the mini, but the ring itself is super cool and useful. As with the cube, the pudding is Uncommon, making it affordable! Okay, but I can’t wait any longer. 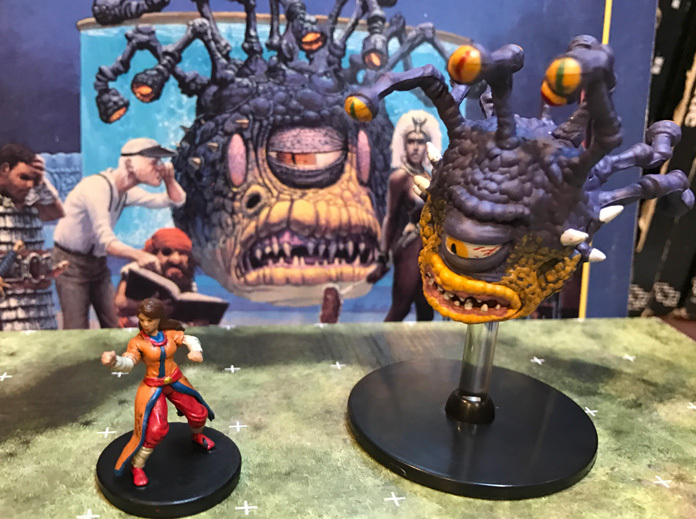 I have to share the mini of the set, the absolutely gorgeous Beholder! (Standing next to a cool monk) Wow, just wow. The colors suggest this is the Xanathar, the famous beholder crime boss found in Waterdeep and the North (seen in the background). Here is another great picture of Xanathar. So cool! Back to that first brick of minis I opened. 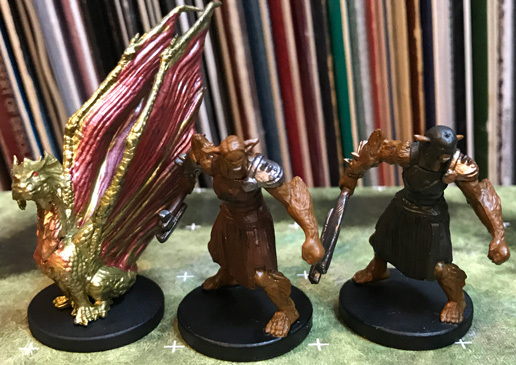 A box of 4 minis might contain these: Giant Rat, Worg, White Dragon Wyrmling, and Kobold (the one with the spiked club – there is another variant in this set with an axe). Those are decent minis. The giant rat is a bit weak, but when I compare it to the other giant rats I have, it isn’t that bad. This box had a rather lame Sahuagin, but a very cool Hippogrif, a Drow Elite Warrior, and the invisible ultra-rare version of that same drow. 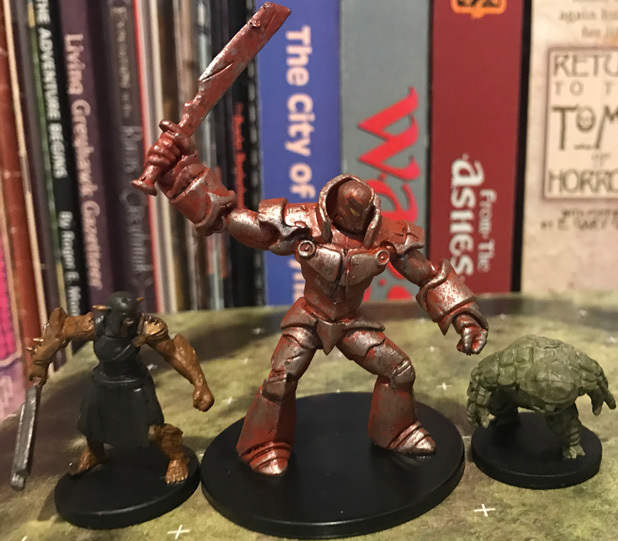 This is an underwhelming but not bad bugbear, the very cool rust-flaked Iron Golem, and a solid Galeb Duhr. 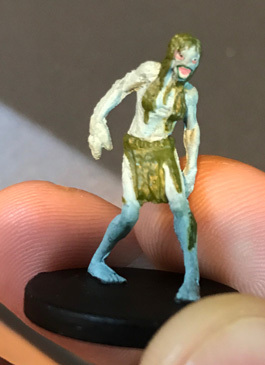 Until now, I had heard of but never experienced broken minis from WizKids. 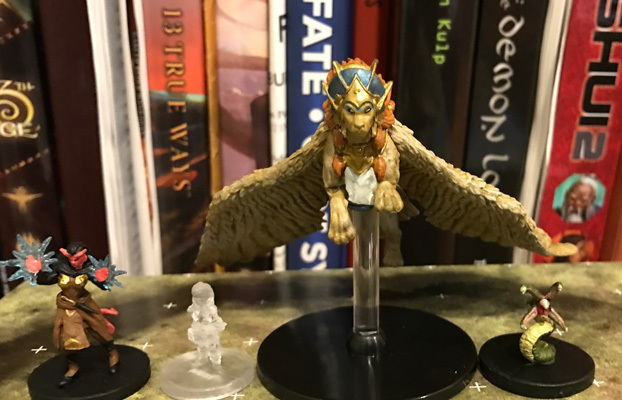 This Androsphinx was my first broken mini, with a broken tail. The Halfling Rogue is very strangely sculpted with perhaps a pie in her hand… but I guess it is meant to be a sling stone? The Human Cleric is cool. Oh, and that Goblin? It is one of 2 variants. Here you can compare the fur and axe version vs the sword variant. The Clay Golem is decent and doubles as an earth elemental. 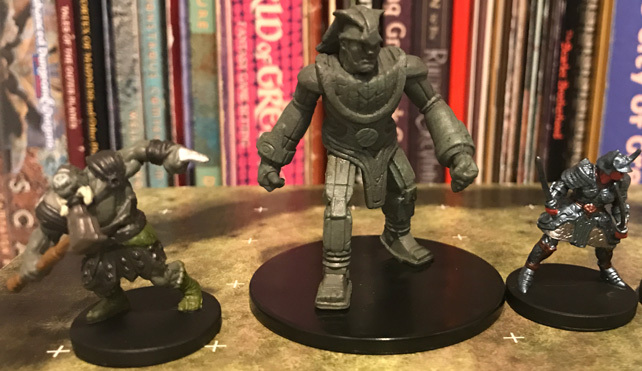 The bullywug is puny compared to earlier models (see a comparison further below) and my very cool Half-Gold Dragon Sorcerer was snapped at the feet! The Orc with sword is shown next to the other variant. There is a Planetar in this set, which uses an interesting flying stand that connects in the back. It holds up fairly well and avoids jokes about where the pole is going. However, this is the third WizKids angel and is an Uncommon… so you might get a lot of these. I certainly don’t need all 4. 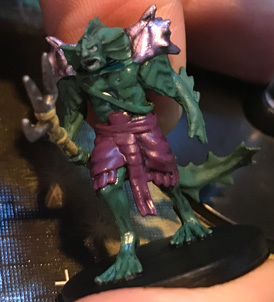 The Elf Fighter has some very cool armor, though the Sea Hag has a very splotchy paint job and looks very thin and frail. 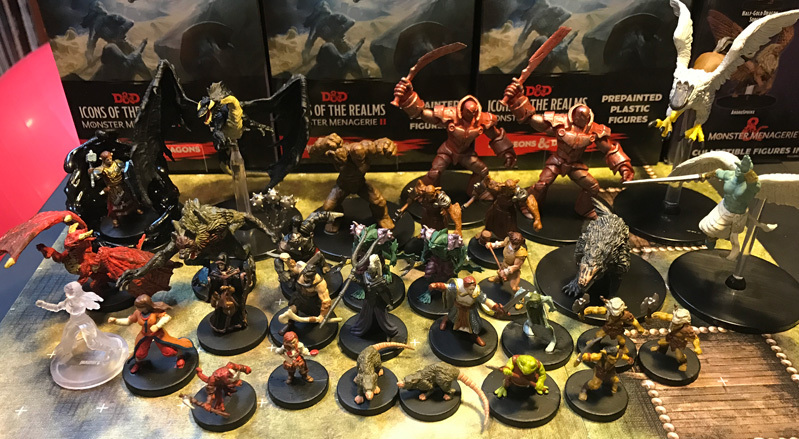 When reviewing the Rage of Demons minis I mentioned how many models were low-mass/puny compared to older models. The Bullywug is an example of that. Yes, the far left is the old Mud Lord boss, but the center one is just a Bullywug that looks far more impressive than the little new one to the right. The new one also has far less detail, with paint applied heavily and without allowing for sculpt detail. There is a neat Mind-Flayer, which is an Ultra-Rare and has variants (one has a strange claw hand, the other has a normal arm). Mine unfortunately came broken – my third broken mini! There are several dragon wyrmlings (small dragons) in this set, including the below Brass Dragon Wyrmling. You can also see the hooded and un-hooded Bugbear variants. 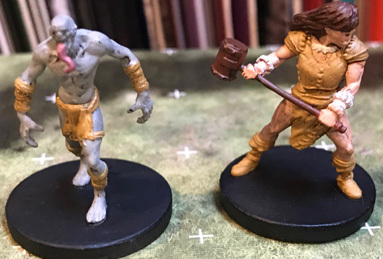 Two very cool minis are the Ghast and the Half-Orc Barbarian! Really cool. 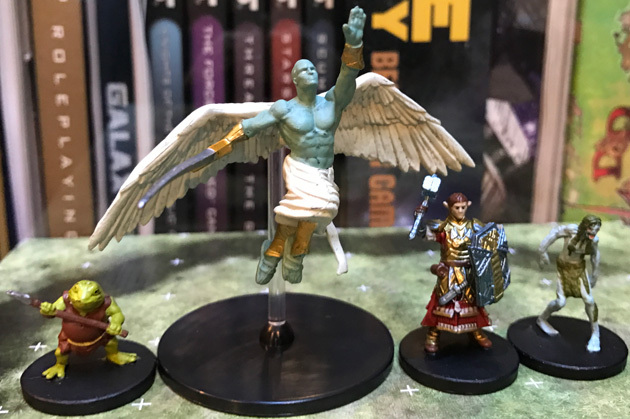 Wizards continues to make their player minis very diverse with gender and skin tone, which is awesome. The Red Dragon Wyrmling is really cool. There is a lot of detail to this Rare. The Gnoll is Uncommon but has nice paint elements (not as good as the rare gnoll in Rage of Demons). The Uthgardt Barbarian is sadly an Ultra-Rare with a variant and I only landed this one. 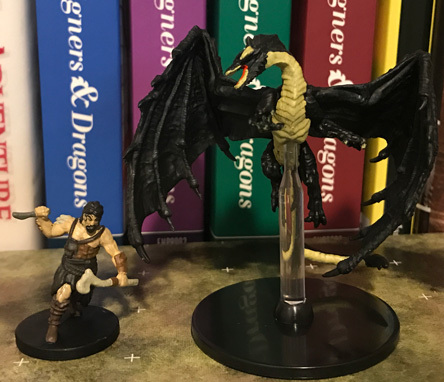 The large uncommon Young Black Dragon is cool, though it lacks the paint qualities of earlier WizKids black dragons or their chimera. A few more to mention. 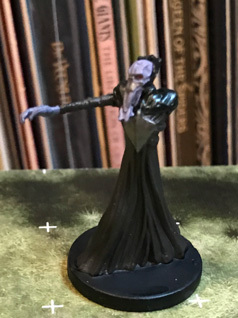 The “Jazz Hands / Spirit Fingers” Tiefling is cool, using smoky colored plastic to create a casting magic effect we first saw in the Human Red Wizards in the Tyranny of Dragons set. The Gynosphinx looks very imposing – I want to use that in an adventure! On the other hand, the Grick is bizarre. If we compare this Grick to earlier sets, it looks a lot like the DDM on the far left, but is smaller and wimpier in every way. Overall, this set has great sculpts and good paints. 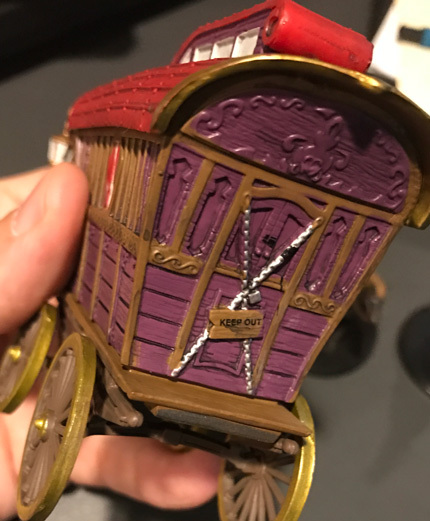 I did see more paint mistakes (including two really bad paintbrush mistakes that made it through quality control) and more broken minis than I expected, but that could just be my bad luck. There are some gorgeous minis in this set. 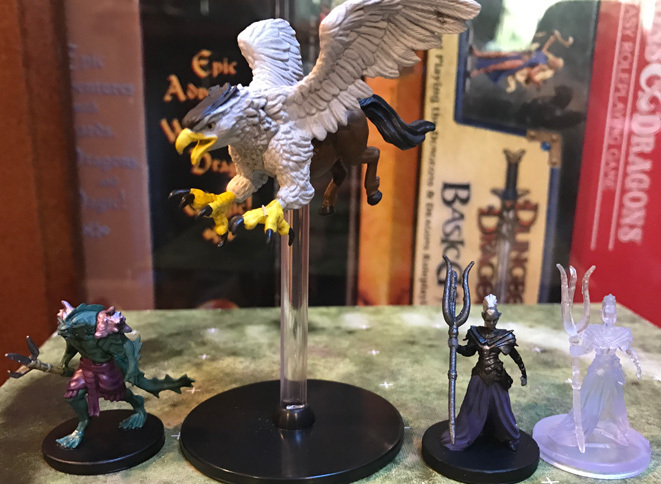 I like that WizKids continues to make their minis less cartoony (a problem with early WizKids minis), using fewer overly bold and unrealistic colors. 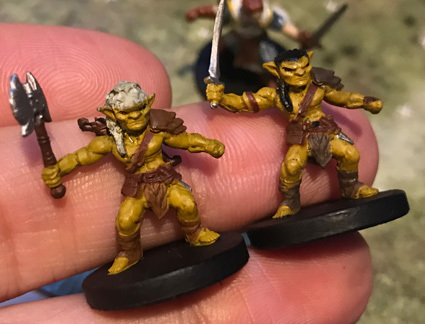 There are still many minis that sorely need a bit of detail (drybrushing, wash), and some need more mass (they look thin, though this has improved from earlier sets). The change to Ultra-Rares is confusing. As you can see below, I now have a bunch of invisible minis. But, I’m not the average person who might get a single one and think it is cool. I do like that I don’t feel I have to chase them. 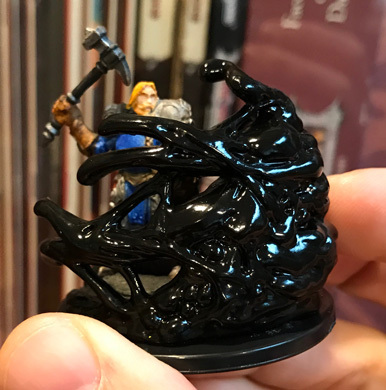 The new decision to have a non-invisible Mind Flayer and an Uthgardt Barbarian, each with a Variant, as Ultra-Rares… that really is strange and not something I like. I would like to have 5 or so of those barbarians… but not at ultra-rare prices! Overall this is a great set of minis. You can’t go wrong grabbing a few boxes or picking up some singles. I look forward to the next set, and I’m already drooling over what the case incentive might be! Thank you for again providing a full set with a case! That case incentive is amazing!!! More like this, please!!! 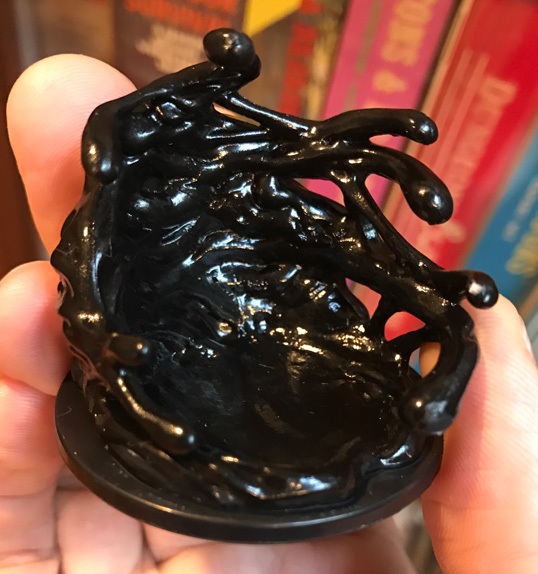 Love the creativity on the black ooze and the bold colors on the beholder! Differentiation and utility was really good. Please return to the A/B variant approach used with the Storm King set. Those variants were better handled (and numbered) than the ones in this set. Numbering is handled erratically across and even within sets. A/B for some variants in a set, but not for others. Invisible minis with the same exact number. Variants that are not sequential: the Kobold variants are number 2 and number 14. Making them 2A and 2B is preferable, or at least 2 and 3. Naming: We have too many minis with the same name both within and across sets, and this will only get worse. Including the weapon of a variant, such as “Kobold (Axe)” and “Kobold (Spiked Club)” would be great, or a return to the DDM descriptor style of “Ogre Ravager” and “Ogre Pulverizer.” Different names really help collectors and are a great help when trying to buy singles online…especially when variants are involved. Don’t make the same mini but weaker. The Grick in this set is just lesser by every measure. In Volo’s Wake is now available on the Guild! This was a special adventure written by Shawn Merwin with two authors picked from authors of DMs Guild products! It was provided first to stores to promote Volo’s Guide to Monsters, and now can be played by anyone. Legal for Adventurer’s Guild! Plane shift Kaladesh provides rules for D&D in Magic the Gathering’s world of Kaladesh. I have really enjoyed seeing this series… I wonder what would happen if they allowed it for Guild authors? Encoded Designs has a free FIASCO playset that can teach D&D to new players – very cool! And, Encoded Designs released The Book of the Tarrasque – an awesome sourcebook documenting the history of the legendary tarrasque, adding great creature modifications, providing handouts and resources, and including a complete 15th-20th level adventure! I will be reviewing this soon! We continue to have so much fantastic live-play D&D! Acquisitions Inc. played at PAX South and was hilarious. DM David is one of my favorite sites – such reverence for the game! He has excellent coverage of Winter Fantasy. Curious what WF feels like? Nelly’s Nerdy Adventures provides a videologue of each day, so you can see what the gaming hall and the town look like. I had an absolute blast at Winter Fantasy! I was able to play with so many amazing players and DMs. And, I was able to try the heist RPG Dusk City Outlaws by Rodney Thompson (lead for Dark Sun 4E, one of the leads for the development of 5E, co-developer/creator for the Lords of Waterdeep board game, and much more). This is a super-fun pick-up-and go game that solves the problems of other RPGs (such as Shadowrun) where you overthink the planning and then what you did doesn’t matter. This is a Kickstarter, has funded and is hitting stretch goals, and you should check it out! 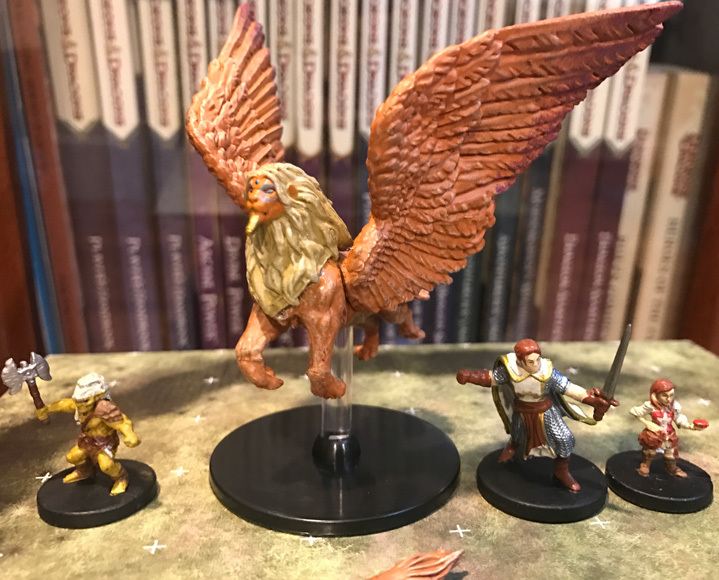 Great review of the minis! I really don’t get why identical D&D monsters are made in noticeably different sizes from one set/company to the next. That new grick looks pathetic! This entry was posted on February 23, 2017 by Alphastream and tagged Miniatures, Terrain.